Location Is Everything! Top 10 Reasons To Love Living in Wake Forest! Southern warmth & charm. This small turn-of-the century town is a progressive community with a vibrant downtown and plenty of old-fashioned appeal. The Farmers' Market. A weekly event offering fresh-off-the-farm produce; pasture-raised beef, poultry, and pork; free-range eggs; fresh and dried herbs; honey, jams, and preserves; fresh-cut flowers; and delicious baked goods. Downtown Wake Forest. 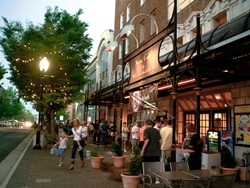 A walkable, urban community bustling with contemporary businesses, shops, restaurants, entertainment and arts. The Historic Districts. Wake Forest boasts four historic districts, three which are listed on the National Register of Historic Places – the Glen Royal Mill Village Historic District, the Downtown Wake Forest Historic Districtand the Wake Forest Historic District. The cost of living and home prices in the Raleigh region are relatively stable and reasonable. Cultural and ethnic diversity. From symphonies to Broadway-style performances, museums of art, history and natural sciences, to all kinds of sporting events, Wake Forest has it all. Easy access to downtown Raleigh. So many choices and real convenience are just a half hour away, including the Raleigh-Durham International Airport. Four distinct seasons. Mild temperatures year round and sunshine for about 210 days a year! Plenty of recreation spots. With 561 acres of parks, open space, natural land and trails, Wake Forest is the ultimate outdoor playground. Plus there are dozens of golf courses and tennis courts. World class medical care. Numerous university medical centers to help keep you healthy.